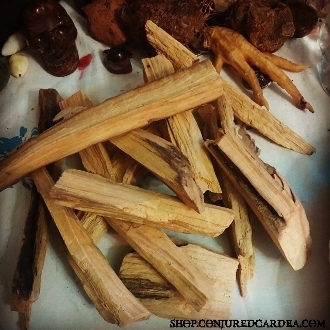 (Burseara Graveolens) Palo Santo or "Holy Wood" is a natural wood aromatic incense used for centuries by the Incas and indigenous people of the Andes. It is a spiritual remedy for purifying and cleansing, and removes evil spirits and misfortune. It is also believed to have healing properties. It has a fine sweet, citrus aroma with underlying notes of frankincense, as it is close relative. It is often used by shamans in sacred plant spirit ceremonies. My Palo Santo is sustainably wild harvested from a reserve in Ecuador from naturally fallen trees and branches that lie dead for 4-10 years before they are harvested. It is VERY light so a 1/2 ounce will last a VERY long time! The smoke is extremely fragrant and cleansing, it is believed to physically cleanses the air as well as clearing the energy, leaving the space and yourself feeling calm and relaxed. Palo Santo can be burned to keep bugs out of a space as well as to keep mold from growing in moist environments. Place a stick in your dresser drawers or closet to scent clothing and keep moths away.